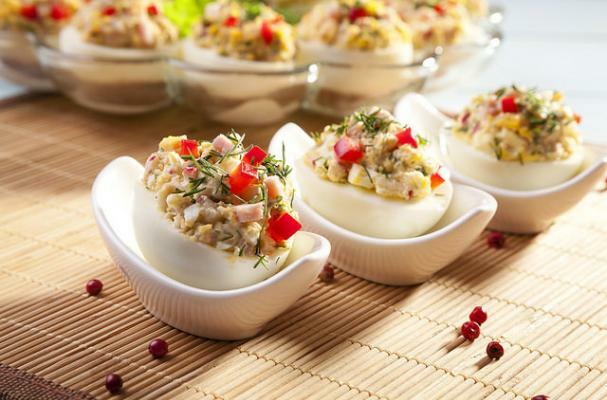 If you love deviled eggs and chicken salad, you're going to love this mash-up recipe of two classic favorites. In lieu of filling the egg whites with the traditional creamy yolks, they're filled instead with a lemony dill chicken salad. They're delicious and filling enough to serve either as an appetizer or side dish at brunch. Step 1. Sprinkle chicken evenly with 1 teaspoon salt and 1/2 teaspoon pepper. Step 2. Grill, covered with grill lid, over high heat (400° to 500°) 6 to 8 minutes on each side or until done. Let stand 15 minutes; cover and chill at least 30 minutes. Step 3. Slice hard-cooked eggs in half lengthwise; carefully remove yolks, keeping egg white halves intact. Step 4. Reserve yolks for another use. Step 5. Stir together mayonnaise, next 4 ingredients, and remaining 1/2 tsp. salt in a large bowl. Step 6. Pulse cooled chicken, in batches, in a food processor 3 to 4 times or until shredded; stir into mayonnaise mixture until blended. Step 7. Spoon chicken mixture evenly into egg white halves. Cover and chill at least 1 hour.